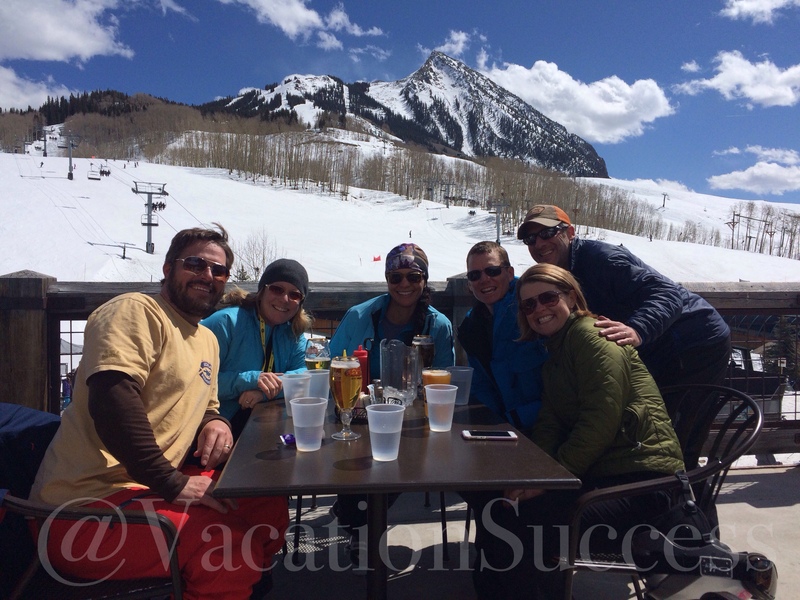 And, this year’s unseasonable warm March, as ushered in by Mother Nature, made us adopt that overused motto for our long weekend in Crested Butte, CO. You had to be up for what ever weather you were given. Making the most of mud season, we skied on six inches of snow at the base and sheets of ice at the top of Mt. Crested Butte. But we didn’t let a little sunshine and rain get us down. In fact, we sunned ourselves with beers in hand and toasted the #UpForWhatever lifestyle. Crested Butte is a little slice of heaven, settled in a beautiful valley at the bases of Mt. Crested Butte and the Red Lady. Award winning fishing runs right through this quaintly maintained Victorian mining town settled and loving built by Eastern European immigrants. Mt. Crested Butte looms over the town, calling you to mountain activities all year round. Everything you do in Crested Butte is more interesting than doing the same activities someplace else. If you ever have a chance to visit, try one of our favorites. Rent a bike, explore the town. Our favorite bike shop is Big Al’s Bicycle Heaven. You’ll be surprised to find Big Al is a petite woman, who to us, embodies the Crested Butte lifestyle. She’s built a successful business catering to locals and visitors a like. She’ll hook you up with the prefect bike – be it a townie or a mountain bike (even in the winter). No need for a car in Crested Butte. Shop Elk Street. From clothing boutiques, to toys, to jewelry, and more. Elk Street was famously painted Budweiser-blue the summer of 2014 when the town became Whatever, USA, for a weekend. Eat like the Nepalese. The best, and probably the only Momo, you’ll ever taste is sold at an outdoor food stand on Elk Street in the summer. And at LoBar during the winter. Its first come, first serve and only sold for lunch. Listen for the noon-time bell, hop on your bike, and head to Elk Street. Drink Camp Four Coffee while petting a random dog that wondered over for some attention. Its said that there are more dogs in Colorado than people. Don’t know if that’s true, but CB loves its dogs. You’ll find one at almost every business and riding along the streets of town. There’s a giant white fluff-ball of a dog that lounges in the doorway of the local liquor store. And always at least one sunning themselves on the patio at Camp Four. Crested Butte has the uncanny knack for making festivals out of the most mundane chores and everyday activities. If you can, schedule your visit to coincide with one of the infamous CB parties.